Pasta with Lemon Roasted ShrimpOf all Seafood Pasta Recipes, Octopus and Pasta Bake is one of the most popular ovenbaked fish recipes in Greece. Octopus are easily available at fish markets in Greece and this is just one of many ways of serving octopus. 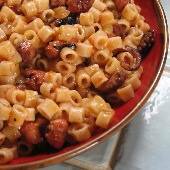 The combination of slow ovenbaked octopus and pasta in a spicy tomato sauce creates a delicious mouthwatering dish. Seafood pasta recipes are ideal in summer with a crisp green salad or in winter with a rice pilaf dish and a Greek Salad. Clean both of the octopus thoroughly. Using a sharp knife, cut the octopuses into cubes. 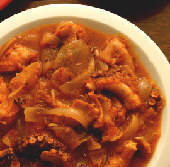 Place the cut octopus in a large heavy based saucepan and place over a low heat. They will produce some liquid and slowly change colour to bright red. Toss the octopus cubes, using a wooden spoon, until all the liquid has evaporated. 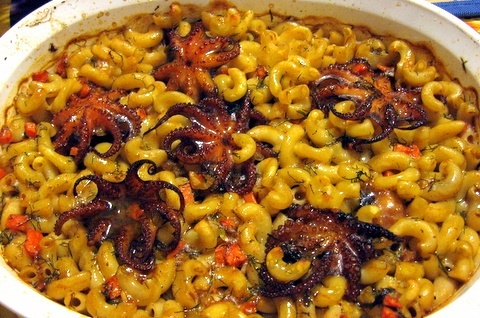 Add the olive oil to the saucepan and saute the octupus for 4 or 5 minutes. Add the sliced onions to the pan and cook for 4 or 5 minutes, stirring until they turn golden color. Stir in the garlic, chilli, bay leaves, oregano, cinnamon and allspice. Once the garlic turns golden, add the wine and boil for 2 or 3 minutes. Add the diluted tomato puree, black pepper and cover. Cook on a low heat for 1 1/2 hours or until the octopus is soft, stirring occasionally. You may need to add some hot water, whilst cooking if needed. Preheat the oven to 160C, 325F, gas 3. Once cooked, bring to the boil and add the 300ml of boiling water. Stir in the pasta, coating it in the mixture. Transfer all this to a large roasting dish. Place in the oven and bake for 30 to 35 minutes, stirring occasionally and adding a little hot water at a time if the mixture starts to look dry. Sprinkle parsley over before serving. Do not add salt to the octupus whilst cooking as this makes it tough. The octupus mixture can be cooked in a pressure cooker if you prefer, it will take about 20 minutes under full pressure.